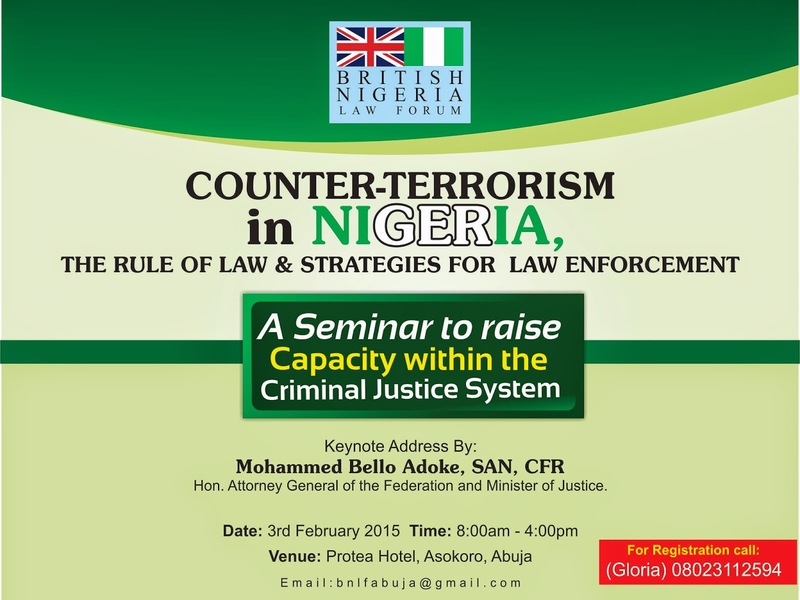 The British Nigeria Law Forum (BNLF) a bilateral, voluntary, professional organisation (based in the UK and Nigeria), which promotes the development of the law and lawyers cordially invites you to the BNLF Seminar on Terrorism Law & Enforcement at Protea Hotel, Asokoro, Abuja on 3rd February 2015 at 12 noon. The objective of this event is to raise awareness of the Terrorism (Prevention) Act 2011 & 2013 (TPA) among lawyers, security agents, law enforcement officers and other interested parties. It will highlight the efforts made by the Federal Government to fight terrorism within the ambit of the Nigerian Constitution and international law. Q& A session chaired by Prof Peter Akper SAN, OFR, Senior Special Assistant to HAGF. Entry is free but places are limited. Please register your interest (full names, professional address & phone numbers) by email to the name and number below no later than 12 noon on Friday, 30th January 2015.